If the band is moving on too quickly and news about them is getting old, I wouldn’t bother writing up a post about them. You could ask everyone everywhere in the musical blogosphere and they’d agree that the Format is great, but it’s getting old so I should follow suit and catch up with the rest. 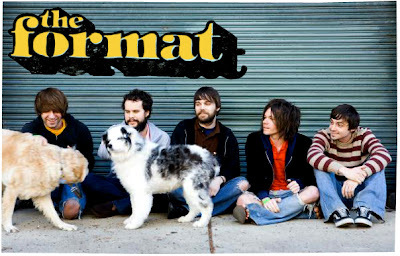 But being where I am now, I don’t think that it’ll be ever too late, and it’s such a shame if we couldn’t be properly introduced to a band that all-bloggers-has-nothing-bad-ever-to-say-about: the Format. The Format is made up primarily of Nate Ruess and Sam Means of Arizona origin; although during touring and recording, an additional of three more members is often included. I do mean what I say up there; that all bloggers has nothing bad ever to say about them. Heather from ‘I am fuel, you are friends’ speaks so fondly of the band due to her sheer love to the band’s first single titled, well – ‘The First Single’. The particular track was taken off of their first EP titled, well – EP. I promise you, I am not joking. Now, that’s a recommendation for you, if Heather likes it, than you’d know better than to not right-click and save as. Their latest album, titled Dog Problems received rave ratings and gained highest spots possible in lists such as ‘Best Albums of the year 2006’ all around the blogosphere. Believe you me, when I say they are one of the most successful bands around. In addition to that, celebrating the one year anniversary of Dog Problems as well as the record’s breaking success; they’ve put up their whole entire album to be downloaded for free on their official website. The offer has long ended on July 16th this year so, I am gravely sorry for those who had missed out –and that includes me. Well, live and learn etc. The album – I’ve heard – sounds like one glorious happy day; pop music that’s fresh, over the top and amazingly wonderful.